Transition Town Guildford is combining forces with Western Earth Carers, Hills Sustainability Group and City of Swan to host the Perth-wide Plastic Free July Wind-up Celebration in Midland on Wednesday July 31. 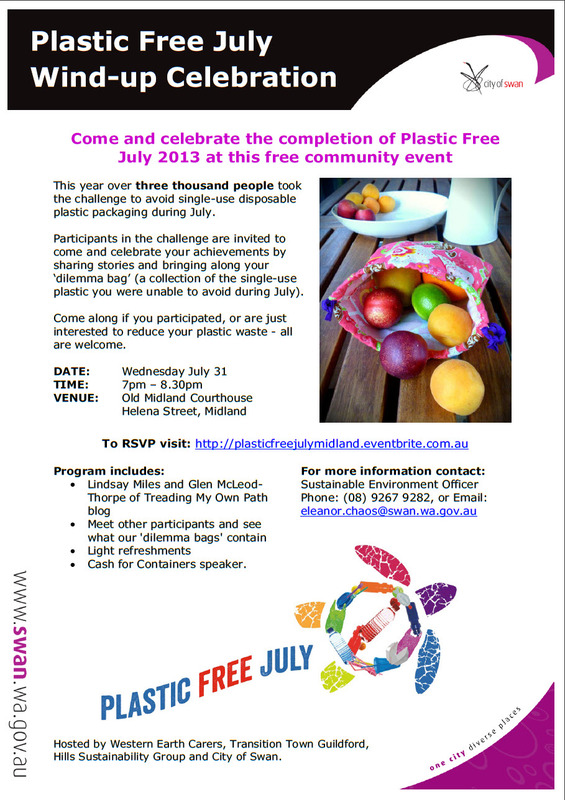 Whether you participated in the Plastic Free July challenge, or are just interested to reduce your plastic waste do come along! 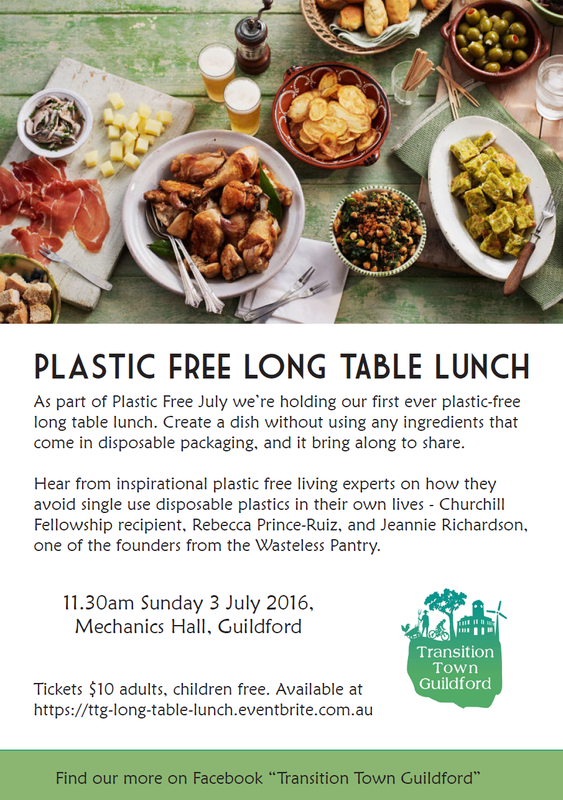 Bring your “dilemma bag” (if you kept one) and your stories and ideas from your Plastic Free July experience. Cash for Containers speaker from the Conservation Council. Please note: there will be train shutdowns on some train lines on 31 July, so please check Transperth’s website for details if you plan to come by train. Last year, scientists did an autopsy on a dead sperm whale that was washed ashore in Granada, Spain. It’s a no brainer that this is the freakish byproduct of our throwaway lifestyles. Think about this for a moment – when you throw something away, where is away? “Away” is overflowing landfills, rivers and oceans. And ultimately animals’ stomachs. “Whales, turtles and seabirds are perhaps the most visible victims of death by plastic, but this extends to most marine animals; particularly those feeding on plankton, from tiny copepods (a few mm in size) to whales. They all ingest plastic particles, often causing death. Moreover, it is not just the physical blockage of the guts by the plastics, but the load of contaminants they carry that also damage the organisms”. And it’s not like humans are immune to plastics either. Chances are you probably have a few plastic contaminants in your body too. As a result of these negative impacts, a growing number of people around the world are now taking a stand to eliminate single use disposable plastics from their lives. They are going beyond the simple mantra of ‘Reducing, Reusing, Recycling’ and now are refusing to consume single use disposable items (e.g. cups, cutlery, straws and bags) as part of the Plastic Free July Challenge. Do you really need to put your bananas in a plastic bag? Is that plastic straw that you’ll use for a few minutes really necessary? And do you seriously need to double bag your meat? Hang on…do you need a bag at all? “Oh but I use the bags as bin liners” I hear people say all the time. But people who are living plastic free have no such excuses. They are exploring alternative ways to line their bins (click here for example), amongst other plastic free ways of living. A lot of our behaviours are unconscious and automatic, but the whole point of the Plastic Free July is to disrupt our usual habits and become more aware of our consumption patterns. So what can you expect when you deplastify your life? When I made the decision to give up plastic, I was surprised by how much healthier, mentally stronger and creative I became. Have you ever noticed that most processed and unhealthy food comes in plastic packaging with a whole lot of additives and preservatives thrown in? Biscuits. Chips. Lollies. You name it. They all come wrapped in plastic. Sometimes individually wrapped in plastic and then placed in a plastic bag. By making the decision to deplastify your life, you automatically cut out these junk foods. You tend to steer clear of fast food places too because what does your food/drink usually come in? Plastic lined containers with little plastic packaged sauces thrown in. Don’t get me wrong, cutting plastic from your life is no walk in the park. It takes something to refuse plastic in a world obsessed with convenience and cheap products. But the skills you learn and develop by taking on this challenge can help you to be stronger and more effective in any area of your life. For instance, plastic free living requires learning to cook from scratch with staple ingredients. If you don’t think you’re much of a cook, just remember that cooking is like any other skill, the more you do it the better you’ll get at it. As part of this years Plastic Free July challenge I organised a ravioli making session with friends. Not only did we produce a delicious meal but we had a wonderful afternoon together full of laughter and fun. I’ve noticed that Plastic Free Living has also strengthened my self control and organisation skills. You see, they say self discipline is your number 1 success strategy and it can be strengthened through resisting the temptation to give into short term rewards. So every time you resist taking the easy option (i.e. single use disposable plastic items) think of it as strengthening your self control muscle. 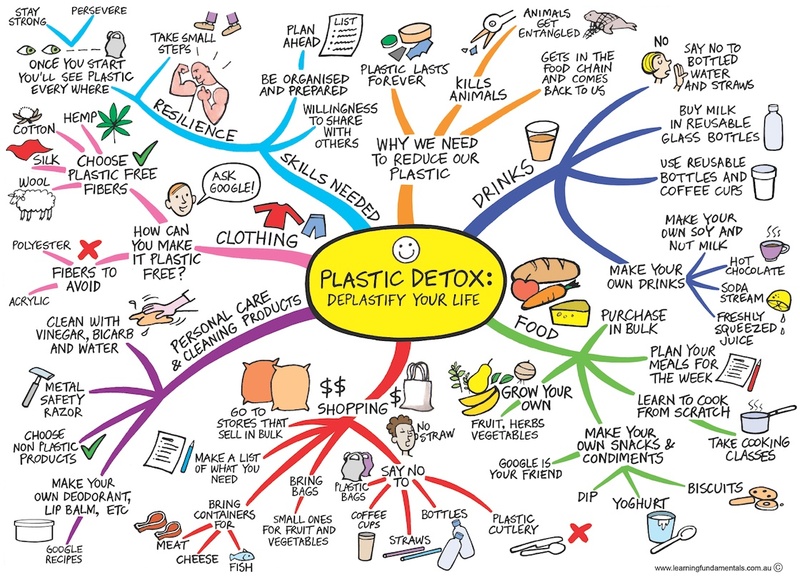 The mind map above contains some ideas on how to kick the plastic habit once and for all. If you try to take on everything all at once, you’ll be setting yourself up for failure. Just take baby steps. Take on doing one thing and once you’ve got that sorted, take on something new. Plastic Free July website: Contains useful resources for cutting back on plastics in a range of areas. Bag it movie: An environmental documentary on plastic. After watching it, you’ll never think about plastic in the same way again. My Plastic Free Life: Beth Terry has been living plastic free for several years now and has created many informative posts on plastic free living. At the end of the day, plastic free living requires taking a stand for the things that sustain us and are most important. Just remember, a healthy body is not possible without a healthy environment. So I invite you to deplastify your life.